Sometime ago I made a post about what I thought was a good plan for casualty stands, well I tried them out in June in Montreal, and they just did not seem to work (Peut-être, que c'était parce qu'ils ont parlé tous français. Qui sait!). Iannick my usual opponent has his own method and I have decided after some thought to go with his plan. Essentially he uses 3 differently sized circular bases (30,40,50 mm) to represent 1, 2, or 3 drops in cohesion, strength etc. This is not a bad system, as it is obvious and you can use a single or a combination of stands for a single unit to represent the damage they have taken. So I had to convert my stands, as well as painting some new ones. I have just recently painted these 3 50 mm stands (loss of 3 pts). I enjoy painting casualty stands, it is easy to get a couple out in an hour. Here we have a Prussian stand, as with all 50 mm stands, I will try to use 2 figures, a cavalry figure or a little vignette. This is one of the new Westfalia Miniatures medics with a Warlord Games Landwehr casualty. I like it. The next is my favourite to date. It is from Perry Miniatures British Casualty pack. If you do not have this pack get it. 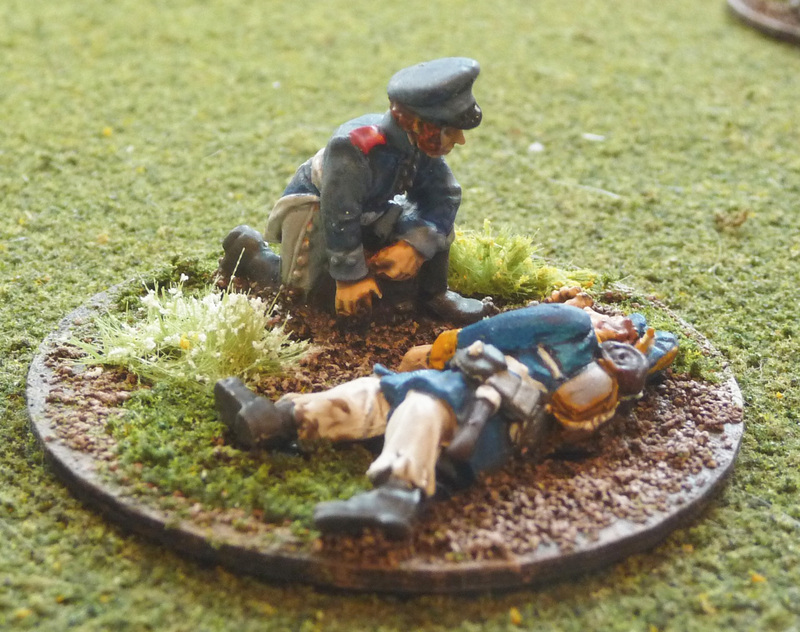 Last we have a shot Warlord Games Prussian Landwehr with a dead Calpe musketeer. Probably not as good as combination as the above 2, but very nice none the less. This is my casualty collection to date, all ala Iannick. Clearly much more needs to be done. Like most wargamers, I have many unpainted figures. As you can see for the British and French, I am using the Perry plastics for the 30 mm stands. For the Prussians, no plastics to date alas, so I will use the Warlord Landwehr metals for the 30 and 50 mm stands, reserving the Calpes which are on a base for the 40 mm stands. I have some Perry French cavalry casualty figures for the 50 mm bases, as well as having the French artillery casualties from Offensive Miniatures. I also have their British casualty pack coming from Offensive to use for the 40 and 50 mm stands. 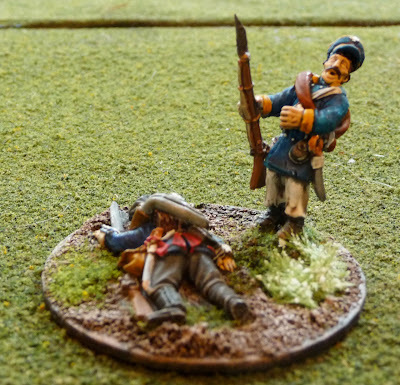 I used Front Rank French casualties for my 40 mm stands, they also have a base like Calpe. Well, I believe that covers the casualty figure market aside from Foundry, which I believe has French and Austrian figures. Iannick's casualty markers are all Foundry. I am focusing on the British and Prussian stands now as we already have quite a few French, I am the only one in our small group who has British and Prussians armies. Very good indeed. Dynamic and characterful. Well done. Excellent stuff. I agree casualty stands often contain so much character. It does take some judgement to put the right figures together for 'that' look and yours have it in abundance. We've tried bases with number-wheels within, but I'd go for a more simple yet solid solution If I had the chance to start all over. I like your vignette idea - the figure poses do look good in combination. The Perry's casualty packs also lend themselves to this. Depending on the rules you use, generally speaking, you can never have enough casualty markers! To give mine a bit more utility I've also tried a numbering system on each so one stand can represent up to four casualties. This works well enough for Black Powder, Warhammer ECW etc. 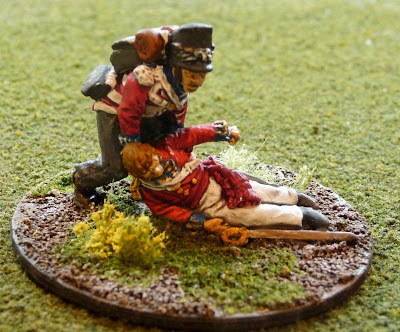 My favourite of your casualty stands is the Prussian 'Sanatz' kneeling over the prone figure: 'und ver does it hurt meine Herr? Really nicely done. Nice work. A couple done in an hour!